Glenn Cornick, the original bass player in rock band Jethro Tull, has died of congestive heart failure at his home in Hilo, Hawaii. His son Drew said his 67-year-old father had been receiving hospice care. He said Glenn was brilliant and cantankerous until the day he died. Barrow-in-Furness born Glenn performed with Jethro Tull from its inception in late 1967 until 1970. 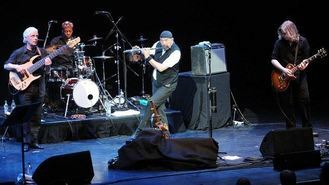 The band's vocalist and floutist Ian Anderson said on the band's website that Glenn brought bravado to Jethro Tull's early stage performances and made considerable contributions to the music scene. As well as Drew, Glenn is survived by his wife Brigitte Martinez-Cornick, a daughter, Molly, and another son, Alex. Cee Lo Green has pleaded no contest to one felony count of furnishing ecstasy to a woman during a 2012 dinner in Los Angeles. Kylie Minogue has insisted her dance moves cannot be compared to the 'twerk' made famous by Miley Cyrus and Nicki Minaj. Madonna has apparently taken a swipe at Lady Gaga in a track leaked from her upcoming album. Redfoo has been the victim of a glassing attack at a bar in Sydney. Ariana Grande has explained that the reason why she was short with fans at a recent meet and greet was because she was still grieving for her grandfather. Jennifer Lopez has teamed up with Iggy Azalea for a new remix of her song Booty. Footage from the first night of Kate Bush's comeback gigs has surfaced online despite the star's plea to her fans not to film the show. Kings Of Leon have cancelled more shows, so Nathan Followill has more time to recover.